War descended upon his young life in the Battle of the Bogside, where he lived in Derry, in August 1969. He then fulfilled his duties as soldier, prisoner, negotiator, campaigner, politician, and internationally recognised chieftain of Irish Republicanism, up to his death in March 2017. Yet a re-iteration of his activity – brief or comprehensive – does not seem to explain his stature, or personality. After all, when he was only 22 years old, in 1972, he was involved in the Cheyne Walks talks between the IRA and the British government, an incredible responsibility at that age. What sort of person is capable of assuming and maintaining the mantle of leadership in the many and varied roles that the struggle imposed upon him? Jude Collins’s book gives plenty of insights. Twenty eight different contributions of working alongside Martin, from comrades, unionists, politicians from the south of Ireland, representatives of different faith communities, media workers, U.S. politicians, and participants in the peace negotiations. All of them recognise his great personal warmth, charm and discretion. Eileen Paisley writes that “All our family had the same warmth towards Martin”. Jonathan Powell writes “…when my mother died, Martin very kindly sent a condolence card. He knew my mother had been sick and that I’d gone to say goodbye to her. He was a very human and humane person from that point of view, very concerned about those sorts of issues”. Peter Sheridan writes “I don’t think his was a set-up charm. I think this is who he was – he was a people’s person. He liked people, had an understanding of people. Maybe one of the reasons, in the second twenty years of his life, why he got caught up in violence was because he was so passionate about people and he thought that that was the only way to help them”. These remarks are made, respectively, by the first family of the DUP, a senior representative of the British state, and a former deputy leader of the RUC/PSNI – his supposed political opponents and enemies. Equally, all of the contributions agree to his extraordinary political talent. Dawn Purvis writes “I watched Martin mature over a period of time and I thought he was a great deputy first minister. He sometimes talked a bit too long, but he was statesmanlike. He went out of his way to get people onside and he had a natural way of doing that”. 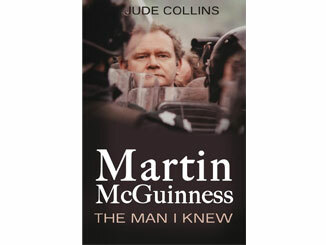 Dermot Ahern writes “Looking back, I think McGuinness was a natural politician. He had the personality for it. He was a good negotiator. He was able to make people like him. He showed that to a lesser extent with David Trimble but to a greater extent with Ian Paisley”. George Mitchell writes “Will Martin have a place in the history of Northern Ireland? Without a doubt. …This was a process that extended, some would say eight hundred years, some one hundred years, but for our purposes you could take it back to 1970… and carry it forward for about thirty or forty years. In that period, Martin certainly was a dominant figure in each phase: the phase of protest, the phase of negotiations and the phase of governance”. This recognition is from, respectively, a leader of the Progressive Unionist Party, a former Fianna Fáil minister in the Irish government, and the US politician who chaired the peace negotiations for five years, none of whom would begin by crediting Martin with any great stature. To obtain this stature, Martin had to show great courage at every point of his activity, as much in making the peace as waging the war. John McCallister writes “There were also times when you saw incredibly strong leadership from Martin McGuinness. Take that awful murder of a PSNI police constable: for him to use a term like ‘traitors to Ireland’. As a unionist, I probably don’t feel it so much, but I know it’s hard to get a much stronger phrase in Irish republican terms.” David Latimer writes “I was aware of the kind of man Martin was and what he’d been doing – I’d heard all these stories. And having been in the British army myself as a chaplain, I picked up stuff. People would be saying stuff about his hands not being clean. And I have to tell you, this church paid a very heavy price over the years during the conflict. In 2003 there was a section of the church burned. But while … the burning was bad, worse than anything else was the loss of five people from this congregation. People who, because of the uniforms they wore – whether it be the uniforms of the RUC or UDR – were killed. The steps that Martin and I had been standing on were the same steps where five coffins of servicemen who had been killed by republicans were carried up. So it wasn’t an easy thing we were doing”. The collection includes Bill Clinton’s eulogy at Martin’s funeral where he said: “He risked the wrath of his comrades and the rejection of his adversaries. He made honourable compromises and was strong enough to keep them, and came to be trusted because his word was good”. So a former UUP MLA, a leading Presbyterian minister, and the former President of the US can grasp his thoughtful fearlessness. When we come to read of those who struggled alongside Martin, we appreciate further and greater depths to this leader. Martina Anderson, Sinn Féin MEP and former prisoner, writes “He was so reflective – he reflected on every situation before he responded to it. I never heard or saw Martin react to a situation with aggression or in a knee-jerk fashion. I used to think he must have a pause button in his head. A number of us, in contrast, would have been quicker to react. But Martin stopped you in your tracks and made you think. I believe that’s the legacy he left us”. And she finishes with “Martin was an amazing, decent human being who loved people and his country. He was someone who simply refused to allow his people to be subjected to injustice and inequality. He was our Nelson Mandela”. The new President of Sinn Féin, Mary Lou McDonald writes “He’s always remarked upon for how personable and how decent he was – and he was! – but my god he was astute as well. You’d see it in simple interaction with people on the street, in friendly situations, but it would also be evident in sometimes hostile situations where he’d have to think on his feet, where an aggrieved person might come across him and where there might even have been media observing. In situations where things could have been stressful for all concerned, he had a way of defusing the situation and sort of deconstructing things. This was a measure of his brilliance, and it allowed him to remain a staunch, committed republican to the very end and yet to take extraordinary initiatives, looking outwards, reaching outwards. You see, he got people; he understood the human condition, the full emotional register”. Yet he soldiered on, to the very end. The decision to collapse the Executive must have been very difficult for him, and it was his call. Immediately, with the institutions in the north of Ireland in abeyance; and the DUP/Tory agreement preventing progress in both Ireland and Britain, Martin’s achievements may, to some, seem questionable. But this valuable collection aids the process of establishing a longer perspective of his contribution. Only through the medium of many voices can we appreciate his contribution. All those who knew him, even briefly, should pass on that knowledge. For what it is worth, here are a couple of the occasions where he made a big impression upon me. The first was at the Extraordinary Ard Fheis in January 2007, called to discuss whether Sinn Féin should enter the policing arrangements in the new Assembly. There were around 2000 people in attendance, for a debate of nearly six hours duration. A diverse array of speakers yanked and pulled at the issue, with great seriousness and eloquence. This after all was one of the most difficult steps for the nationalist community in the north to take, given the role of the Orange state police in maintaining oppression. Although close observers of republicanism would have little doubt about the outcome, still the debate had to be “won”. Two contributions definitely secured the victory. Martina Anderson drew the clearest line for the continuity of the republican struggle when she said that “If war is the continuation of politics by other means, then the reverse is also true”. Then to seal it Martin gave the story of a community meeting in Derry held to discuss the issue. He explained how a number of relatives of victims of the police and British army walked out of the meeting in protest. Martin said “When they left, my heart went with them”. He captured the personal loss that many felt while pointing to the next step in the struggle. Another expression of his genius was at the formal opening of the restored Assembly in May 2007, following agreement between the leaders of the DUP and Sinn Féin. It was a long day for those in the Sinn Féin party, filling a coach outside the Falls Road office in Belfast, quite early. At Stormont itself, there was a mass of national and international press and media. It was a hot day, and the formal ceremonies were extensive. So after all the public business was done it was with great relief that Sinn Féin members and guests assembled in the long gallery to be addressed by Martin. Rising to the occasion, Martin immediately gave a perspective for what Sinn Féin was doing. He explained that in the fifty years that the Assembly had been dominated by the Orange ascendency there was only ever one Act carried which was from a nationalist originated Bill. That was the Protection of Wild Birds Act. In saying this, he was evidently saying that never again would the nationalist community be subjected to the indignity of powerlessness. The struggle since 1969 had raised the community to the point of a having a veto over the future of the north, the ascendency gone forever. Such an unexpected illustration demonstrated that Martin had a consciousness which was formed by the liberating developments in Irish history, allowing him to give honour and expression to those wanting to further change it. The book succeeds in returning something of Martin to us, recommendation enough, surely.